No doubt, 4th Oct 2011 has been a very bad day for iSheeps, their beloved fruit company left them with a minor upgraded phone after 16 months of waiting and frustration. no wonder why Steve Jobs left the company just a few weeks before new iPhone 4S announcement, he decided to leave the company in glory days. the legend will stay the legend. lambs are to be slaughtered. I know many iSheeps have decided to leave iSheep camp and join the Android revolution. that’s a wise decision friends 🙂 welcome to superiority and excellence. 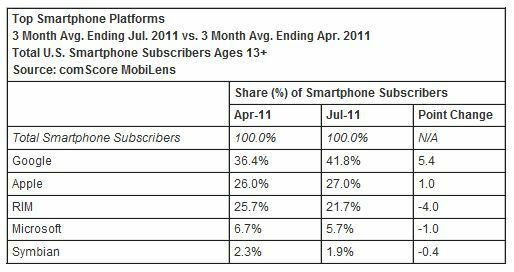 As you can see in almost two years Apple has hardly kept its market share and has only grown from %25 to %27. it has happened during the golden age of iPhone 4 ! while Google market share has grown from 5% to 42% ! now you can guess what would happen with current weak embarrassing iPhone 4S ! and this superiority and excellency of Android phones now. I even expect a minus Point Change for Apple market share in next reports.